A committee of past and present North Melbourne residents who believed the region's past had never been fully recorded, are compiling a history book to be published next year. The Hotham History Project's committee has been researching the region's unique past, with the help of North Melbourne's people, since March last year. Project coordinator, Lorna Hannan, said the committee had been swamped by people offering information, personal accounts or photographs. Project Secretary; Winsome Roberts, said contributors needed to submit their research from m archives and transcripts of inter-views by the end of March. The committee will hold a public meeting on Saturday, March 30th, at the North Melbourne Library from 2-5pm, so that contributors can submit their work. Ms. Roberts said although the committee was winding up the research process, people who wanted to write about their experiences in North Melbourne were still welcome to contribute. The committee was interested in personal accounts of North and West Melbourne life from any era, such as school life in the 1950s and 1960s or the experiences of migrants in the post war period, she said. Sources for the project included newspapers, archives from local schools and businesses, photographs and drawings. The project has also documented the stories of people who experienced North Melbourne life or had a connection with it through family. Ms. Roberts said Melbourne City Council had approved a grant to the project which would help cover costs this year. The committee came together with a desire to record the stories of North Melbourne's older residents and workers before they were lost forever. They also share an affinity with the area. Ms. Hannan has lived in North Melbourne for more than thirty years. Ms. Roberts has lived in North Melbourne for 15 years. Project Treasurer, Rae Nicholls, lived in Brougham Street from 1938 to the 1960s. Her family ties to North Melbourne stretch back to the 1860s. Oral History coordinator, Mary Kehoe, has lived in North Melbourne for twenty years. She said she recognised a need for a comprehensive history of North Melbourne when she was working at the La Trobe Library. Project Editor, Janet McCalman, has lived in North Melbourne for three years. She compiled a history of Richmond, Struggle Town and a book on middle-class Melbourne, Journeyings. Both books won major literary awards. 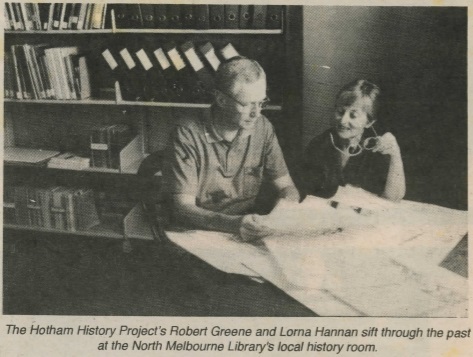 Ms. Hannan said that in addition to the book, the group hope to hold exhibitions and prepare taped interviews for an oral history collection to be held at the North Melbourne Library. She said the history project would give past and present residents of the area a deeper under-standing of their identity. The project's work would also have wider appeal. "There are many people who would be interested in this part of Melbourne, partly because it is a microcosm of Melbourne itself, but also because...this is the area, which more than any part of Melbourne, has almost pioneered the whole idea of mixed use. "It is a community where mixed use is the norm, where industry and commerce and residential land can all be found in a single street, over and over again. "So it's of interest to people who don't live in the area to see how that kind of life has evolved," she said. by Sara Bannister, February 1996.